A second birthday cake for a six-year-old girl. This one I bought from Ambrosia Bakery. 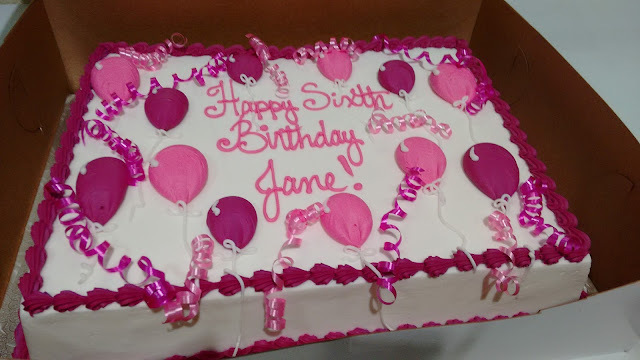 I got white icing because it looks prettier with the pink, but the cake itself was chocolate with chocolate buttercream inside. It was also THICKLY iced. Like, THICK to the point of tasting too much and too sweet. Jane ate some, and Liv ate some cake itself. Cake is probably her new favorite word. Jane would NEVER have eaten cake when she was 19 months old. Perish the thought. Things change I guess. I had a great time going to Jane's class and reading Twinderella -- a "fractioned" fairy tail because it was a re-telling of a fairy tale and this one used fractions -- halves, quarters, doubles. The teacher said it was her best reader yet, mainly because of how well the book fit into their unit. We had checked it out of the library by chance from the new books section. I also got to eat lunch with Jane, and that was fun. Daddy stayed home with Liv. He took her to her library story time so she didn't have to miss that. Sweet potato! This afternoon I was going to take Jane shopping for a new lamp, but she decided she'd rather go home and open her presents. She's got a ton of great things from family and us. My absolute favorite was when she opened the Target Our Generation doll (a knock-off style of American Girl Dolls) she jumped up and said "thank you, thank you, thank you, Mommy" and came and tackled me in a huge hug and let me snuggle her for a long time. I think I'm going to have some fun crocheting clothes for her doll, which she named Indigo, and probably buying some matching Jane and Indigo outfits too. Anyway, Jane said I could pick out her lamp on my own later, so I will. Only requirement is pink, her favorite color. We've re-arranged Jane's room to make for a side table and access to a lamp, tissue, trash can, water, etc. Still getting used to it, but it's a good set up. Domestic posts don't make for good blog fodder, but someday I'll be glad for these ramblings, just like I'm grateful for the record of my weeks in email format.